Kids slaying some orcs and finding treasure at one of RPG Research's regular sessions at Kendall Yards' Spark Central. On an otherwise normal Saturday morning, the Adrian family is investigating a cultist hideout when a fight breaks out. The cultists don't stand much of a chance against the hulking barbarian and one of his companions, a stealthy dark-elf rogue played by the dungeon master's brother-in-law, Kolby Wade. Also gathered around the kitchen table are Josh's mother, Carrie, grandmother Reggie and sister Kayla. After the battle, the family of six takes a break for tuna melts and tomato soup. Though the outcomes of this particular role-playing narrative will be utterly unique, the gathering of imagination and adventure is not. In an age when technology-driven entertainment has never been better — from blockbuster video games and virtual reality to the spectacular imagery of major film and television franchises — people are increasingly choosing their kitchen tables over screens to find engaging escapes. As part of that trend, Dungeons & Dragons, the role-playing game of swords and sorcery first published in 1974, has returned to the spotlight at an unprecedented level. Indeed, 2018 was the biggest year ever for Dungeons & Dragons, according to its publisher Wizards of the Coast, a Renton, Washington-based subsidiary of Hasbro. Dungeons & Dragons' modern resurrection reflects what's being seen in tabletop gaming as an industry. According to the market tracking firm Internal Correspondence, sales of such games topped $1.5 billion in the U.S. and Canada for the first time in 2018, an increase of 8 percent over the previous year. Another venue introducing the under-18 set to Dungeons & Dragons is Spark Central, the public learning and technology center in Kendall Yards. 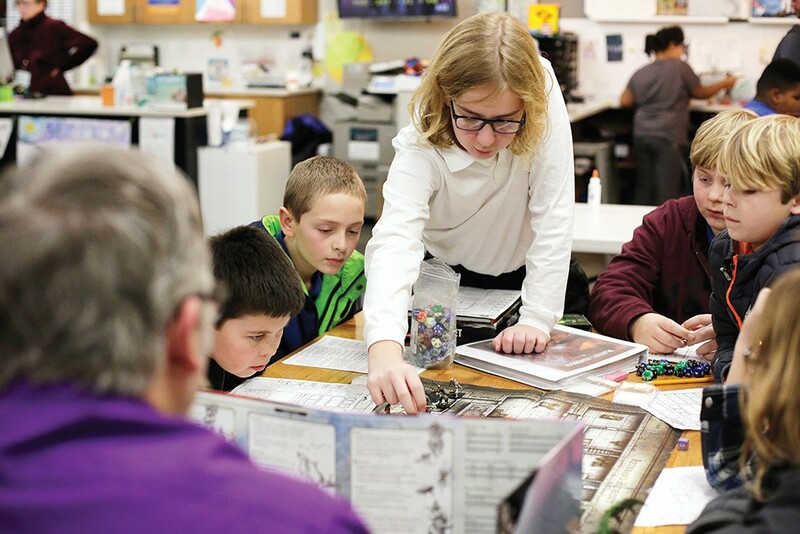 There, volunteers and staff from Spokane-based nonprofit RPG Research host twice-monthly drop-in sessions for both D&D and other role-playing games. RPG Research founder Hawke Robinson studies the numerous positive effects role-playing games like D&D can have on at-risk youth and mentally or physically disabled populations, among others. In addition to sessions at Spark, RPG Research brings one of its mobile gaming centers, a converted bus and trailer, to other locations around the Northwest on the two Fridays a month its staff are not at Spark. "As a group of people, we have slayed dragons and saved cities and stormed fortresses and had characters we'd grown to love die. And we've made stories that are more immersive and relatable and personal than anything we could have read or played electronically and watched on TV, in a much more social way as well." A longer version of this story appeared in the Dec. 20, 2018, edition of the Inlander. The original print version of this article was headlined "Flights of Fantasy"